Recently, PlanOmatic announced the launch of the PlanOmatic Referral Program – a program designed to reward PlanOmatic’s faithful clients who have helped us grow by providing a constant flow of referrals. In a recent survey, PlanOmatic found that 23.2% of existing clients came to PlanOmatic through referral. That’s almost 1/4 of our book of business – it also says something about PlanOmatic’s service. The PlanOmatic Referral Program is simple. If you refer one of your fellow agents to PlanOmatic, we’ll send you a $50 Visa Gift Card. For all the details, click here. We’d like to say thank you to all our clients – you’re our biggest fans. We founded PlanOmatic in April of 2005 at Western Michigan University in Kalamazoo. It’s been five great years. Five years of growth in earnings as well as geographically. Overall, we have made great decisions, but I have always noticed one factor that needed improvement: our pricing structure. This issue has poked and prodded our team over and over and over again without rest. When Justin and I were discussing the new PlanOmatic Referral Program, a light bulb went off for both of us. ..
Our pricing has always been based on the size of your listing, a.k.a. square footage. Beginning August 1st, we are making a big change. Our full service interactive floor plan & photography tour will now be priced based on the listing price. Why, you ask? Previously, PlanOmatic had different rate sheets for every region where we operate. Naturally. A 2,000 sq. ft. listing in Michigan (was $149) is quite different from the same size home in Los Angeles (was $349). With our new pricing model, one price sheet covers the entire country. Different square footage calculation methods were used in different regions. For some, we used square footage mapped at the property, and for others, the square footage listed in the MLS. This caused a great deal of confusion for our clients. With our new pricing model, square footage no longer plays a roll in our pricing . In order to avoid client confusion in our various operating regions – regions with formerly divergent price structures – we hesitated to publish our rates on our website. With our new model based on listing price, we will now happily display our single rate sheet on our website (coming soon). Larger sized homes with lower listing prices made PlanOmatic unaffordable at times. With our new model based on listing price, PlanOmatic is now affordable for anyone, with prices starting at $149 for our full service floor plan & photography tour (keep reading to see how this change may affect you). Granted, that price of $149 won’t apply in some regions like California. But for some, this means a lot. In West Michigan, you’ll find that prices are going to stay pretty much the same. Same with Connecticut. The biggest change in price will be affect California. 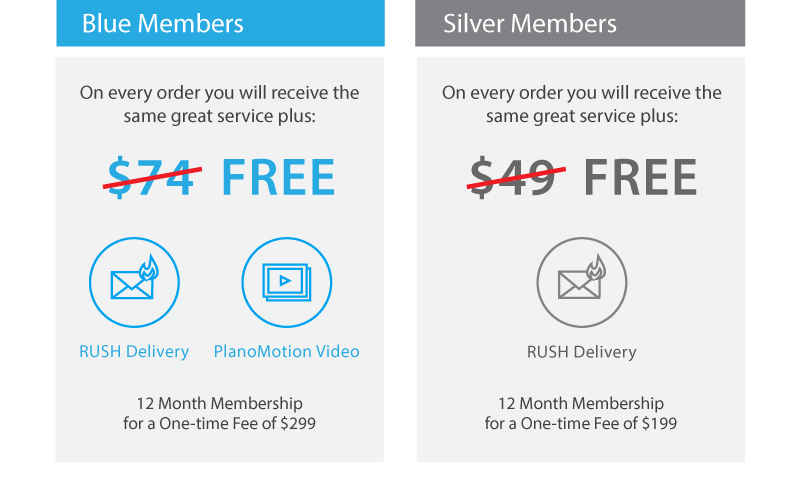 Previous to the restructure, PhotoPlan pricing in California started at $349. Based on our cost analysis, most listings in California will now be priced at $299 for listings with asking prices between $750,001 and $1,000,000. For listings $750,000 and below, our pricing will now be more affordable than ever, ranging from $249 to $149 (see the chart below for a complete breakdown). Finally, home prices have dropped significantly in the last five years, yet PlanOmatic prices have stayed relatively stagnant. Not anymore. As home prices shift, so do ours. We hope you find this change will eliminate a whole lot of confusion, and that you find our prices more to your liking. We may be restructuring our pricing model, however we will continue to provide you with the highest quality of photography, interactive tours and customer care.